Actions: A creamy foam that makes cleansing a comfortable and pleasurable experience. 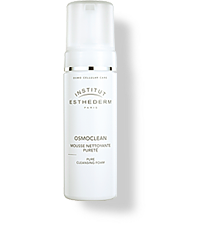 Thoroughly cleanses by creating an emulsion to lift away impurities. Relieves discomfort caused by hard water. Activates the natural defense system thanks to the production of a natural antiseptic that eliminates potentially harmful bacteria. Stimulates beneficial bacteria. Acts in perfect osmosis with the skin while protecting the hydolipid surface film. Optimizes the cells energy environment and boost their activity. Indications: For all skin types, even the most sensitive. Those that like creamy textures. Instructions for use: Apply morning and/or evening to damp face and neck. Rub in with small circular motions. Leave on for a few minutes, then rinse thoroughly.